Home / GOVERNMENT/POLITICS / Opinion/Editorial / OSUN: Governor Rauf Aregbesola could be right for his non-payment of workers' salaries? 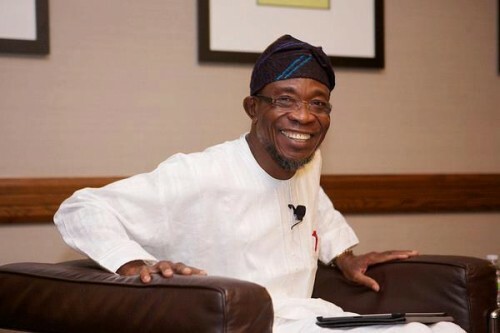 OSUN: Governor Rauf Aregbesola could be right for his non-payment of workers' salaries? Knock! Knock!! Knock!!! I am the Village TownCrier. There has been so much moaning and groaning from this part of Nigeria, called Osun state so I decided to pay the small state a visit since my King has been away to the next village for an inauguration ceremony. This almost sounds like the May 29 Nigerians are dying to see like the coming of Jesus Christ. All political parties always have a trend of operations in Nigeria. The leaders of the People's Democratic Party are always in a haste to siphon state funds. They anticipate looting even before they are inaugurated into power positions constitutionally. This they do through some 'pseudo' projects with hyper-inflated amounts of money. This is the type of government that will allocate a road construction project to a medical doctor or a water project to a lawyer or even a orthodox medical project to a native doctor without adequate knowledge of the project. The governor collects his share after the funds are officially disbursed. The project is thereby left unconcluded or probably commissioned to last for a few months and then abandoned. As for All Progressives Congress, this party believes in 'political noise', false alarms which can also be capsulated under propaganda. APC leaders especially the governors exploit the power of the mass media to deceive the masses and turn them against themselves. This is what happens when Nollywood directors storm politics. Nigeria has become their set and location; the masses are their actors. APC Governors have the common administrative style of window dressing by engaging in massive showboating projects like road constructions, bridges, building of schools, boosting transport activities, improving the health sector for the first tenure all in a bid to gain popular support of the ignorant masses (mass clientelism) but in the second term after being re-elected to consolidate the good work, they rest of their oars to amass wealth for their private interest. Governor Aliyu Adams Oshiomohle of Edo state is a typical example of such an APC leader. People are hastily putting Governor of Oyo state, Isiaka Abiola Ajimobi in that class over the unpaid salaries of state civil servants for the past 4 months. I am pretty confident Ogbeni Rauf Aregbesola of Osun state is the one mentoring him. Under normal circumstances, a state like Osun has no reason to trend online and I am being frank about this. Today we have Osun state gist trending online for the wrong reasons with several underlying and consequential factors. In summary, Governor Rauf Aregbesola has indirectly wished death on his workers by not paying their salaries for a staggering 6-month period. For the purpose of emphasis, to clear doubt I meant months and not days. State civil servants are middle-class people in the society who averagely afford the necessities of life. They could also be referred to as top economists who draw several scales of preferences to survive. You remember the case of 'best opportunity foregone in elementary Economics? The bitter truth is that Aregbesola got carried away looting developmental funds from the state treasury to fend off competition from his political opponent Iyiola Omisoore of the People's Deceiving sorry I mean Democratic Party, PDP for the gubernatorial seat in Osun state. Life is lonely; Iyiola Omisoore has quietly retired to nursing his wounds and counting his endless losses from the election loss after several failed suits in court while Aregbesola has indirectly transferred the side effects of the high costs of campaign to the masses. Aregbesola has blamed his inability to pay workers’ salaries for 6 months (November - May) on the Federal Government for its 40% cut on state allocations. A large chunk of the state allocations have been used to service debts in the state. He also attributed it to banks' decline of his loan requests. This act has adversely affected the economic development of the state and also attracted criticisms from the People's Democratic Party (PDP). Team Oluomo, the campaign organization of the Peoples Democratic Party (PDP) candidate for the Osun Central Senatorial District in the February, 2015 election, Oluomo Oluwole Oludaisi Aina, observed that “this is an unusual but strange financial engineering of Osun State resources’ by the Aregbesola administration for the financial doldrums that the State is currently witnessing. Osun state has recorded several abandoned projects as contractors had to leave due to no finance. Governor Aregbesola has been heavily criticized for using alien economic principles and strategies he learnt during his time as the commissioner for works in Lagos state ignoring the different realities on ground in both states. These are states with opposite levels of developments, Osun state today is a rural state. This has furthered plunged the state into deeper economic crisis. import programmes and policies of Lagos state to operationalize in Osun State. Aregbesola's alien economic decisions have been traced to his long stay in Lagos. He was not living in Osun until he became governor. He has become a stranger to the people because he does not know what they want or what their priorities are. Experience they say can never be bought, no matter your knowledge of theoretical principles; you will be faced with the challenges of practicality. The atmosphere is always different on the field of play. Shockingly, Aregbesola never commissioned a single project in his first 3 years in office except they were done behind closed doors. The only thing one could point at is the government’s claim that it has employed 20,000 youths who are mainly graduates that earn less than N10,000 as salary each month cutting grasses or cleaning drainages. This is not the type of job creation people are yearning for in Osun. The people are looking forward to youth empowerment programmes. Civil servants in Osun state have been living from hand to mouth and the situation hit the extreme point when a helpless worker decided to commit suicide by drinking an Insecticide over his inability to cater for his family. In a country where there is supremacy of the rule of law, strict adherence to the law as well as respect for labour laws, Aregbesola could be heavily sued for damages. The state seems helpless and this is happening at a time where there is a widespread claim that Nigeria is broke. 18 other states in Nigeria are caught in the web of debt crisis. What is the way forward for Osun state? Is there a future for the Nigerian state as regards employment and personal development? The public sector is going broke while the private sector is not viable enough to accommodate the every growing labour market. 1) Inability to remit pension contributions to all members of staff for 2 years running which has amounted to 15% of each monthly salary of staff. 2) Unpaid 6 months salaries of workers which is still counting with no concrete plan or attempt to salvage the ailing situation. 3) No leave bonus from the month of December, 2014 till date. 5) No staff promotion since 2013. This is so sad. One wonders why man is naturally selfish, brutish with an unlimited desire to acquire wealth as claimed by Thomas Hobbes on his works on man in a state of nature. If the reports of Aregbesola's son rumoured money laundering case which happened of recent is to go by, then it’s safe to say his administration is governed by selfish interests. Kabir Aregbesola was reportedly arrested at the Muritala Muhammed International Airport in Lagos on Tuesday May 12, 2015 with a huge sum of money in foreign currencies amounting to N178million ($912,820) en route UAE. It is widely believed the case was covered up with several media organizations and security operatives taking their share of the money. Always remember that there is always an element of truth in any rumour. There is no smoke without fire. In conclusion, Governor Rauf Aregbesola has no explanations whatsoever under normal standards not to pay their salaries. I urge him to proffer a concrete solution and stop giving explanations to media outlets that are hungry for hot contents to sell. Failure to pay them can be likened to eating a meal at a restaurant and paying with excuses about a poor economy. It is that strange and unusual. Aregbesola's act also comes with a contagious effect which has affected Oyo state as Governor Ajimobi is under an indirect tutorship of Aregbesola. Remember Ajimobi replicated the O-yes youth employment initiative of Aregbesola in Osun state. And also, Governor Ajimobi is yet to pay the salary of Oyo state workers since January this year. Who knows the other state that is quietly waiting to follow this trend? Do they want their workers to buy guns for armed robbery? Thanks for reading thus far, the Village Town crier will like to return to his normal duties of delivering messages across to the rugged people.